Striker Annie Heatherson says Yeovil deserve more credit after extending their winning run to three matches with a 4-0 victory over London Bees. 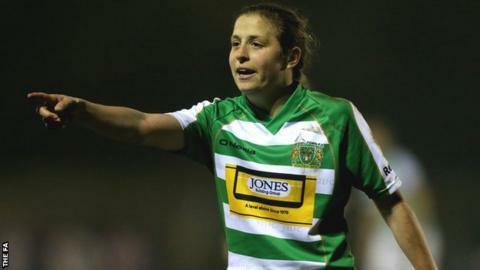 Heatherson netted twice for the Lady Glovers, who stay third in the Women's Super League Two table. They have scored 11 goals and conceded just twice in three league games since losing successive games to Doncaster and Reading at the start of the season. "A lot of people don't give us enough credit," Heatherson said. "I think we prove week in and week out that we are very team related." Lady Glovers captain Corrine Yorston opened the scoring with a penalty after Heatherson was brought down by Bees keeper Imogen Riches. She was again taken down in the box by Aoife Hurley before the break, but Yorston was denied a second from the spot by Riches. Heatherson added two goals in four minutes after the break, with substitute Alys Hinchcliffe making it 4-0. Elsewhere, goals from Courtney Sweetman-Kirk and Bethany England in Saturday's 2-1 win over Aston Villa helped Doncaster Rovers Belles return to the top of the table. Fourth-placed Everton overcame bottom side Watford 3-1 at Berkhamsted, while Millwall Lionesses and Durham shared the spoils in a goalless draw.